You have completed one or more questionnaires in the Online Talent Manager system. This report explains the results of these questionnaires. All Online Talent Manager tests were developed by highly experienced psychologists and are based on years of research. Having said that, these results are based on your responses, your openness and honesty play a large role in the accuracy of this report. There is no universal scale of personality. We calculate your results by referencing a 'norm group'. The numerical score given for each trait is a representation of how your results compare to those of the norm group. Your score may vary depending on the norm group(s) used to generate this report. Your scores on all traits will be represented as a single number ranging from 1 to 9. 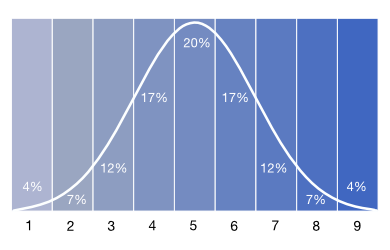 This graphic displays the shape of a normal distribution of respondents. As you can see, the 1 and 9 scores are quite extreme, with each of them only occurring 4% of the time and that fully 20% of all respondents will have a 5 score on any particular trait. These scores are NOT a representation of 'good' or 'bad' results, they are only a representation of how you scored compared to others in the norm group. The Quinn Model is a way of looking at behavior in the workplace. This model is an effective way of relating personality information to real-world behavior, styles, and competencies. The graphic we use to display this information is called a 'circumplex'. This means that traits that are near each other have a high correlation and traits that are far away (or opposite) have a negative correlation with each other. Thus, if you have high scores in the upper-right quadrant, your scores will tend to be low in the opposite, lower-left, quadrant. In general, these graphs are a handy shortcut for relating different personality test results together into a single framework for easier understanding. The Octogram questionnaire focuses on the personality traits that drive behavior in the workplace. These 8 personality traits have a strong correlation with Robert E. Quinn's Competing Values Framework. Based on your answers, the test system has calculated your work style preferences. These scores represent the most natural way for you to behave when working, your work "comfort zone". You can develop and work outside of the pattern shown here, but you will find that work to be energy draining and/or frustrating. The Octogram is formulated to focus on your work styles and does not, necessarily, reflect your behavior outside of work. Pioneer Pioneers are innovators and dreamers with fresh ideas and continuously trying to do things in a different way. They take the initiative when it comes to making changes exploring open-ended creativity. You have a very strong desire to experience new things, think new ideas, take chances, and explore possibilities. You have difficulty with completing tasks and working in an environment that discourages new ideas. Networker Networkers build relationships with new contacts, express their emotions freely, and are open to others. They are enthusiastic communicators, keenly interested in meeting new people. This score indicates that contacts are important for you and that these relationships are necessary for you to have a pleasant work environment. You have flair, and can easily make contacts and build personal relationships. Your spontaneity, enthusiasm, and optimism help you to gain the trust of and influence others. You build a network of contacts and and have a good feel for how to use this network to help you reach your goals. Achiever Achievers are driven, ambitious, and self-motivated. They make high demands on themselves and others. They are continuously aiming high and competitive. You thrive in high pressure, high tension situations. You are very ambitious and driven, a classic "Type A" kind of person. You are very competitive, it's not enough to do well, you want to WIN. You are very action-oriented, pragmatic, and very decisive. With such a high score, there is a danger of pushing yourself and the people around you to hard in pursuit of victory. Strategist The strategist is the long term thinker, defining goals and thinking about how to reach those goals. The strategist identifies fundamental problems and is creative in looking for effective solutions to those problems. This score indicates that you are a long term thinker and that you enjoy shaking up others to make them aware of more than their immediate surroundings. You bring fundamental problems to light and show creativity in coming up with solutions to those problems. You plan for the future and try to implement those plans with conviction. You make others aware of the need for change. Anchor Anchors want order, structure, and quality. They see themselves as system builders and people who create order out of chaos. They are thorough and make sure that work is completed properly. You should avoid work that consists of detailed or repetitive tasks. You will be more comfortable in situations without strict guidelines and rules. Your work space tends to develop a little clutter over time. Analyst Analysts seek to break problems apart and weigh alternatives. These are the people in the organization that are 'the voice of reason'. Analysts prefer dealing with facts, focus on being rational, and looking at situations from different perspectives. You like solving puzzles and working out solutions to complicated problems. Your outlook is somewhat pessimistic and you rely on facts more than emotions when making a decision. You are usually rigorous in hunting down every aspect of information that impacts on your problem. You give as much information as possible to stakeholders in a decision. You want to avoid committing to a course of action until you have all of the facts. You are objective and thoughtful. Team Player The Team Players are the binding elements in your company that keep people working together and keep the atmosphere upbeat and supportive. Team Players are focused on building consensus, team harmony, and conflict management. You are much more focused on getting results than on maintaining team harmony and a good working environment. If a group activity does not directly impact your work, you will not be involved. You feel no need to interact with your coworkers about anything other than work. You do not worry too much about what your team thinks about you, you are at work to work, not make friends. You prefer to work alone or feel that you are competing with your coworkers more than cooperating. Helper Helpers are understanding and take the time to listen to others. They have a good insights into the feelings and lives of others. Helpers understand the art of supporting the emotional well being of other people. Helpers work to improve communication, develop others, and help others achieve their full potential. Where a Team Player is more focused on the group, a Helper is more focused on individuals. You are very direct and blunt when dealing with others. You are not tactful, especially when it comes to giving criticism. You do not take the time to listen to what other people say. You are ambitious, business and result oriented. Your coworkers probably describe you as being unapproachable or even cold. The full, paid version of this report includes specific texts based on your actual scores. But take heart! You still get a lot of value out of this report. In fact, because you are viewing this through a web browser, I can do something here that PDF's will not allow, I can give you links to some nice videos I put together for you. Are you still a little unclear about what the numbers represent? I made this handy video for you so that you can understand just what your scores say about how you compare to the rest of the world. What's this Competing Values Framework thing all about? When I mentioned the Competing Values Framework in the introduction, I am talking about a management model used to understand how common enterprises (where 2 or more people are working together on something) operate. You might be familiar with some other psychological models for understanding humans (Big 5, MBTI, DISC, OPQ, etc), but we started from the other end. We used a model that describes how people work together and then developed the test to measure it. If you haven't already done so, subscribe to the newsletter on the Octogram.net web site. I will send you an email every week or so for 8 weeks with some extra information and next-steps. If you want to use the Octogram in your own work, Online Talent Manager is a tool created for HR professionals. We have a broad range of tools and applications available, just a brief email away! Contact us info@onlinetalentmanager.com or just look around our website Online Talent Manager.com.